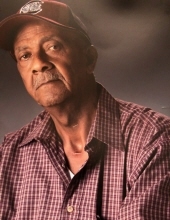 Celebrating the life of Robert James, Sr. "Rabbit"
Obituary for Robert James, Sr. "Rabbit"
On Thursday, September 6, 2018, Robert James, Sr. "Rabbit" departed this life at his residence. Born on March 23, 1958, in Summerton, he was a son of Mazie James and the late Robert Lee Butler, Jr.
Service of remembrance shall take place on Friday, September 14, 2018, @ 12:00noon from the Historic Liberty Hill AME Church, 2310 Liberty Hill Rd., Summerton, where the Pastor, the Rev. Robert China, shall bring words of consolation. The service of committal shall follow in the Historic Liberty Hill AME Church Cemetery. The family is receiving relatives and friends from 2:00pm-10:00pm at the residence of his mother, Mazie James, of 1244 Jim Ross Rd., Summerton. To send flowers or a remembrance gift to the family of Robert James, Sr. "Rabbit", please visit our Tribute Store. "Email Address" would like to share the life celebration of Robert James, Sr. "Rabbit". Click on the "link" to go to share a favorite memory or leave a condolence message for the family.